Over the years Westminster College and William Woods have enjoyed a number of partnerships. One tradition, followed during the holiday season for many years, was Christmas Vespers. Background information on Christmas Vespers is sketchy, and what is found is basically some brief descriptions in yearbooks as well as a paragraph reference in Bill Parrish’s wonderful Westminster history account. The next couple of years information is brief. 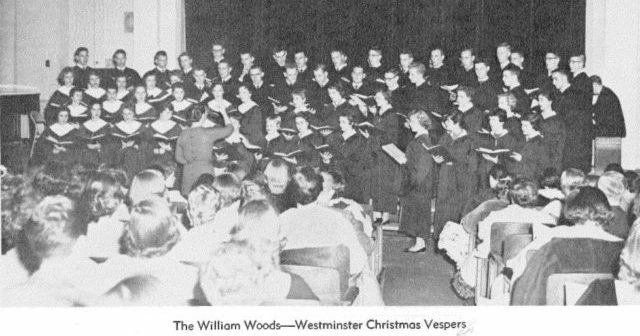 A Christmas holiday concert in conjunction with both William Woods and the Christian Church Choir is described as an enthusiastic success in the 1934 yearbook. However, no mention of a Christmas concert appears in the 1935 yearbook. Then in the 1936 yearbook: “A Christmas program given in conjunction with the William Woods Glee Club opened the singing season.” In the 1937 yearbook, the joint concert is described as an “annual” event which drew a large crowd to Swope Chapel. Therefore, the inference is that Christmas Vespers began in 1935. As the next few years unfolded, the Westminster Glee Club became known as the “Men of Song” and Christmas Vespers became the high point of the Christmas season. Traditionally held in candlelit Swope Chapel on the Sunday afternoon before Christmas vacation, the even became so popular that some years a double performance was held to accommodate the crowds. Some years the concert was taped for local broadcast on radio station KFAL as well as one of the St. Louis radio stations. One year Christmas Vespers was even broadcast nationally on the American Broadcasting Station. In 1955 Christmas Vespers had to be moved to the Christian Church because of the deteriorating condition of Swope Chapel. The last mention of the annual event is in the 1959 yearbook, so whether the last Christmas Vespers was in 1958 or it continued for several years following without being mentioned is unknown. What is known is that in its heyday this event was the highlight of the holiday season in Fulton and drew enormous crowds. Find more fascinating stories from Westminster’s history here, and like Westeryears on Facebook.